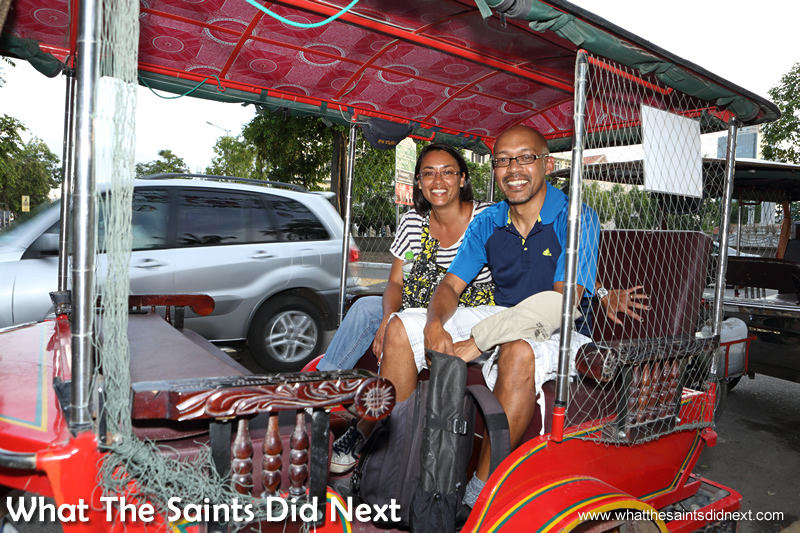 On our way back from another Cambodia excursion with Nim, our choice for best tuk tuk driver in Phnom Penh, Cambodia. “I-hear-you-want-to-go-to-the-Killing-Fields,” sings a tuk tuk driver in Phnom Penh, approaching us from behind as we walked by the Royal Palace. “Your wife just told me,” comes the cheeky reply accompanied by a wide grin. I hadn’t uttered a peep. Darrin eyes him up and (probably from sheer tiredness) surrenders and laughs; because you’ve just gotta love that snappy sales tactic which was refreshingly different. 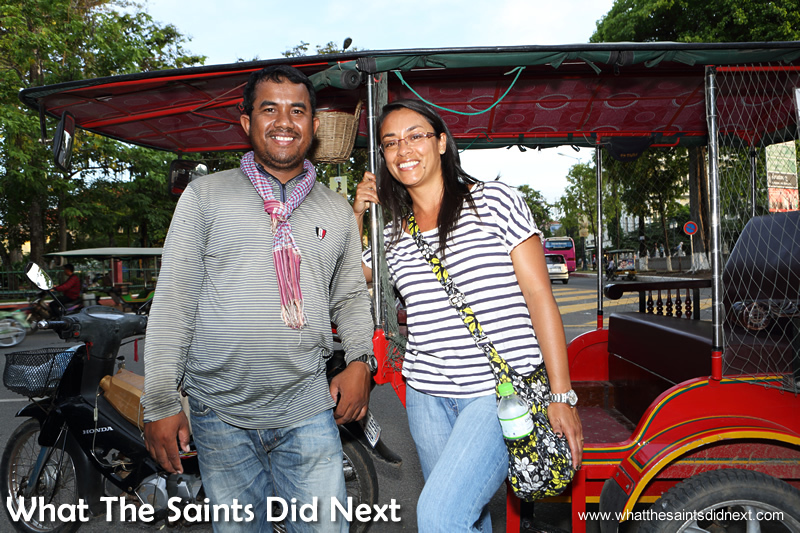 That was our introduction to Nim Chantra the best tuk tuk driver in Phnom Penh, Cambodia. Disarmed by his humour, non-confrontational manner, good English and that certain likeable quality; he was our driver for the entire stay. Plus he resembled a St Helenian friend of ours. 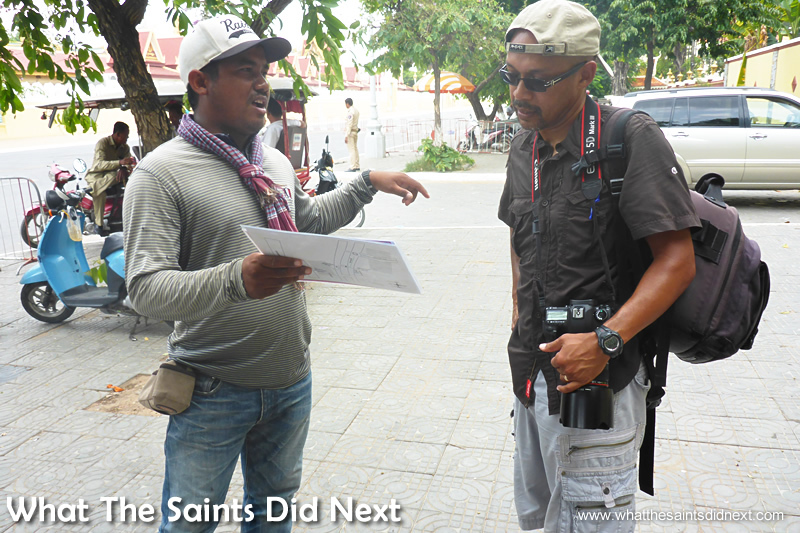 This is the moment we first met Nim, outside the Royal Palace in Phnom Penh. 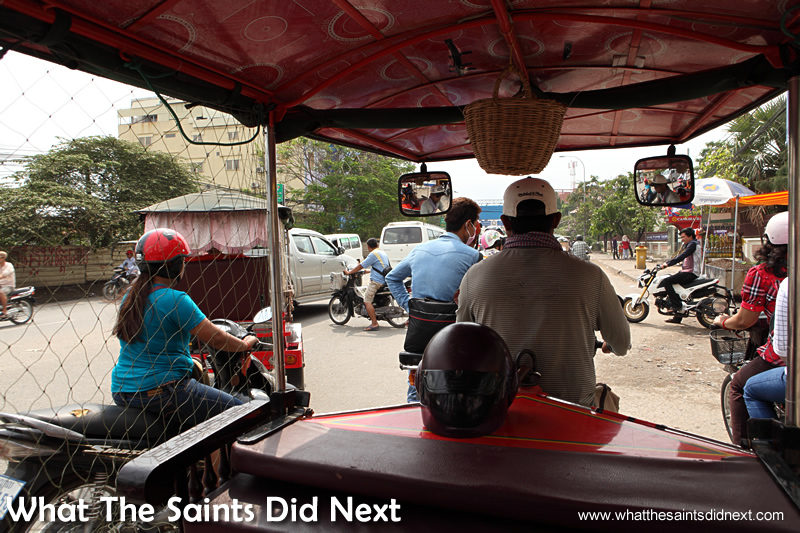 With practiced ease he’d slip into the organised chaos of Phnom Penh traffic and deliver us safely to the city’s attractions. We’d chat about Cambodia, travelling and photography. How to get his website up and running, the English language and the class he teaches back in his home province of Kamport. Yes, you read right, Nim is a qualified teacher. Two days a week our tuk tuk driver in Phnom Penh teaches 30 high school students then swaps hats the other five days driving in the city. We met him during school holidays. 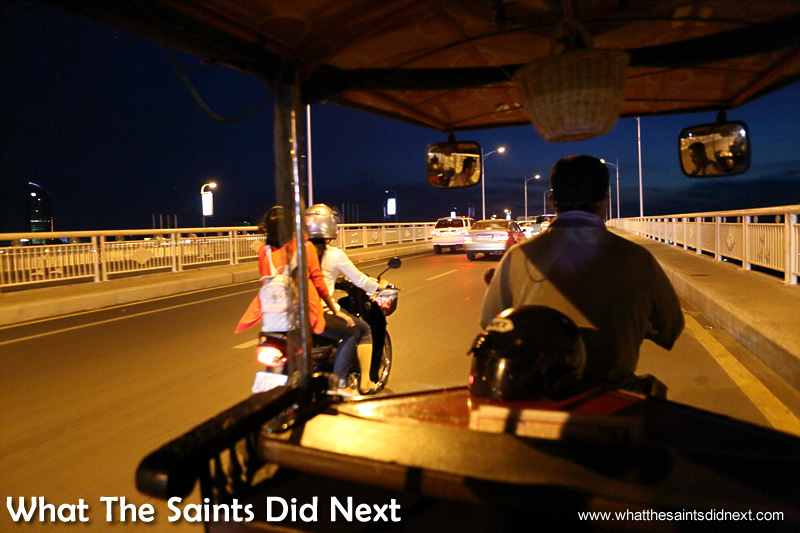 The view sitting behind a tuk tuk driver in Phnom Penh, Cambodia – taken during part of a night tour of the city. 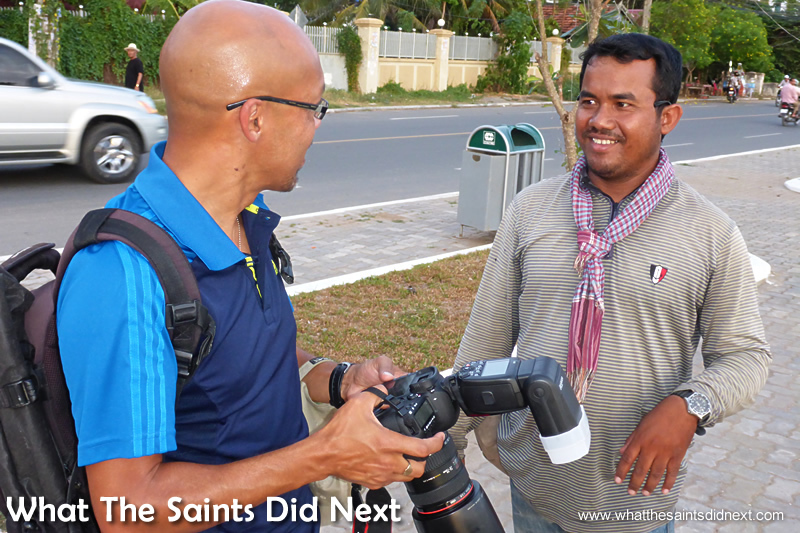 Swapping tips – as well as being a tuk tuk driver in Phnom Penh, Nim’s also a keen photographer. Nim gained a Masters Degree in IT after four years studying at the Royal University of Phnom Penh, a subject he teaches along with Economics at a state high school and “just basic ABC” English to primary aged children. This was near the end of a long day, very tired, just got back from visiting Wat Phnom. Every week Nim waves his wife of 10 years and two little girls goodbye, travels 187km in three hours by bus to the big city and his second job. He parks the tuk tuk in Phnom Penh. “I want to build my home and make something for my family,” he told us earnestly. Government teacher salary is $200 (USD) per month for a 16 hour week. A new house will cost $20,000. The tuk tuk taxi service is an expanding business and not all drivers have licences, “This is fine in Cambodia, but I don’t agree,” he told us, “I have a licence for the bike.” Thank goodness for that. View from the passenger seat with Nim’s helmet looking back at us! 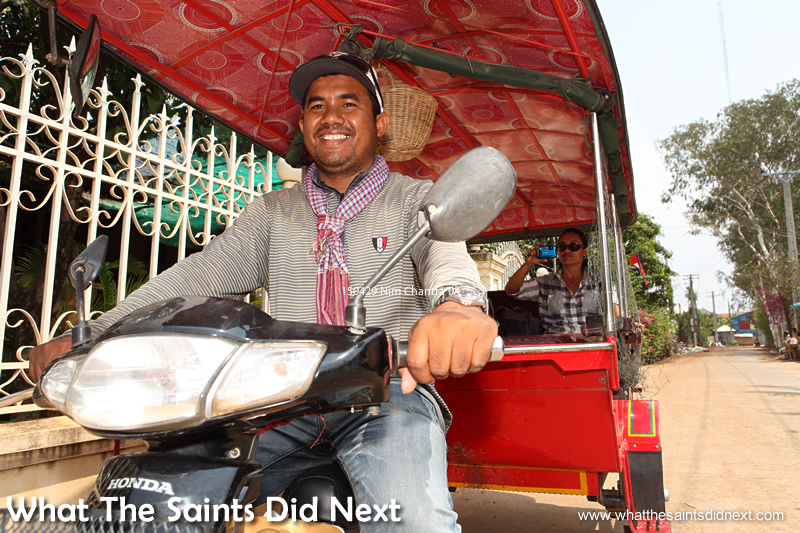 Like many of the tuk tuk drivers, Nim doesn’t always wear his helmet. His sat perched at the front of the tuk tuk looking back at us like a headless fiend. The only time he did wear it was to make space for our luggage going to the bus terminal. 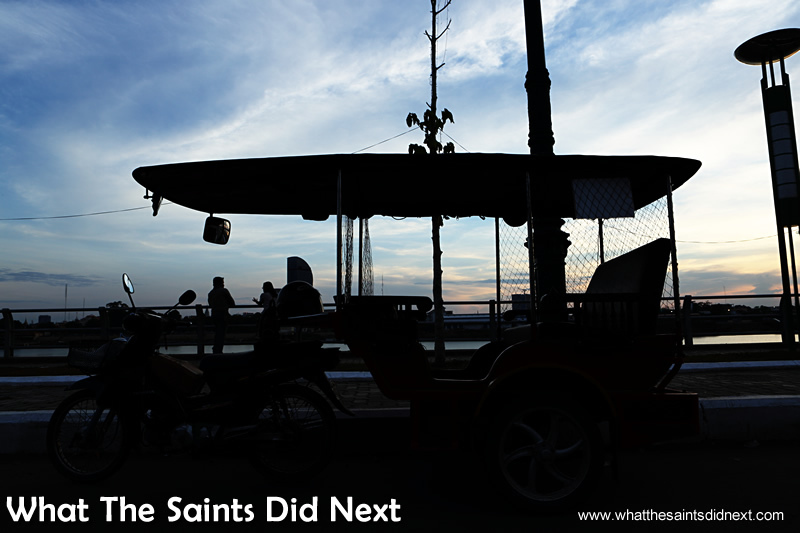 Parked up on the side of the Mekong, watching the sun set over Phnom Penh. He told us about Lakeside, a once flourishing tourist hang-out. “That place was popular especially for the backpackers. But now the government took it to develop. They are rebuilding everything and closed it down. The lakeside had a floating village and people had to move outside. So now that place, is empty,” he shrugged his shoulders sadly. Phnom Penh has many attractions and according to Nim the most popular are Wat Phnom, Central Market and Russian Market, S-21, Killing Fields, Silk village, Mekong island and the Old City. 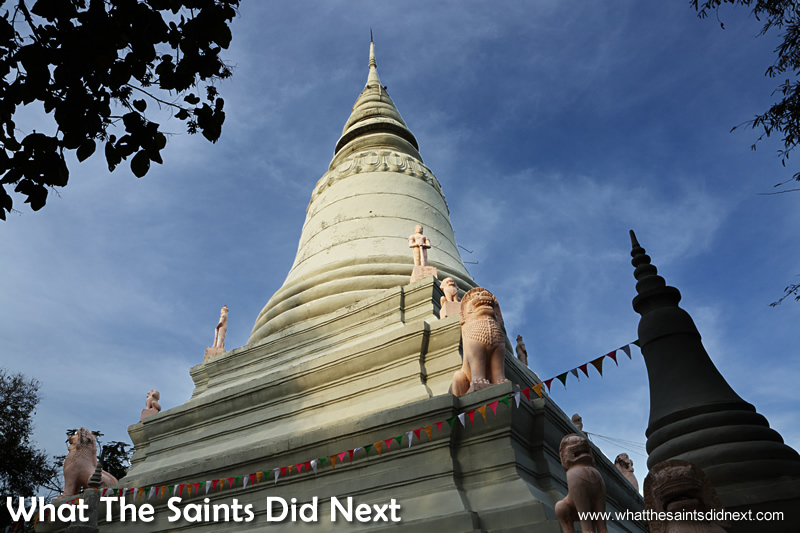 Wat Phnom temple is on Nim’s list of highlights on a tour of the city. A very comfortable seat for us to view the city from. Those who do engage in conversation mainly hail from Australia, Europe, Malaysia, USA and of course, St Helena! We asked if he’s travelled outside Cambodia. “No, never,” he replied like that’s a joke, “only six provinces in Cambodia. Anyone travelling to Cambodia and looking for a reliable tuk tuk driver in Phnom Penh, why not give our friend Nim a try? While you’re at it, be a chatty ambassador for your country; give him a few stories to share in class. Nim Chantra, best tuk tuk driver in Phnom Penh, Cambodia. Great story, loving the adventure! Thanks Susan – it’s wonderful to met people of the world, the adventure never stops! He really is Shirley – I can imagine he’s also inspirational to his students. Nim seems to be a wonderful person, smart and hard working. 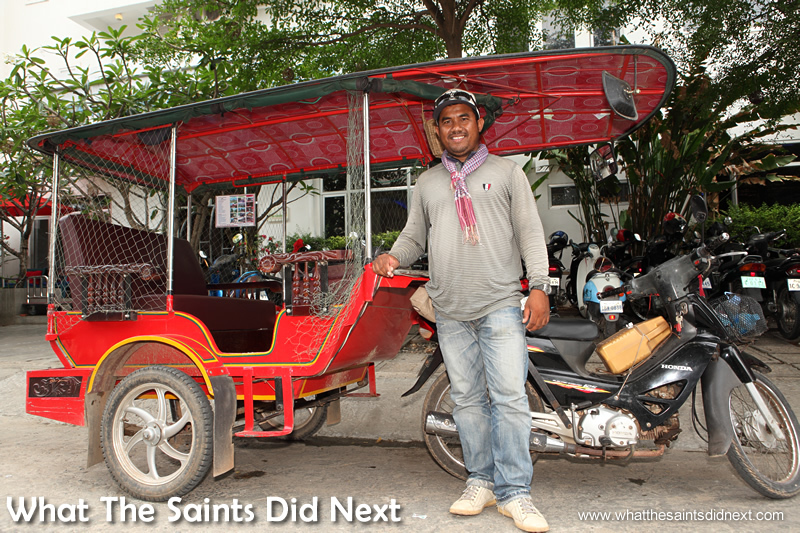 Hey maybe a Tuk-Tuk would work with a part and ride from Ladder Hill into town and back Hmmm!! We were really grateful to have met Nim and he’s such a pleasant and hard working guy. BTW a tuk-tuk park and ride sounds good for St Helena we’ll sign up! Although you’ll need powerful engines to manage the steep incline of Jacob’s Ladder.